I don’t have any more info than in the text. It’s interesting to see they also made an upright wheel. A Finnish upright wheel was mentioned in a discussion in a group I follow on internet (as so often, I don’t remember where). I haven’t seen the Irene wheel so far. I may have seen the Ulla wheel without knowing what it was. If I had time to do research on our wheels, I would probably find some information. But as I don’t have that time, I only hope that someone would take on this task. There are university students out there who could do it as part of their studies. But what I can do is to go to museums wherever hubby and I end up on our road trips, and I can take photos if that’s permitted. Not all museums are that kind to people like me, who point there cameras at everything in sight. It’s a good plan for next summer! When I told hubby about a wheel with golden decorations in a museum in northern Finland, he said “I thought you’d like to go there, I saw the road sign a while ago”. He was on his way to another town a few hundred kilometers east, and when seeing the word “Museo” the dear man thinks of me. I wonder why? I leave it to you readers to decide. Thanks to the kind spinners in the Facebook group Kehrääjät, who have given me some hints on where to find nicely decorated wheels! Silver and gold, that’s something to ponder upon during the cold dark winter that is soon upon us here on the northern hemisphere. Thanks also to Toika Looms that kindly sent me the info above. EDIT: Right now I got a message from Betty in the Netherlands, telling me there is a group for these wheels on Ravelry! 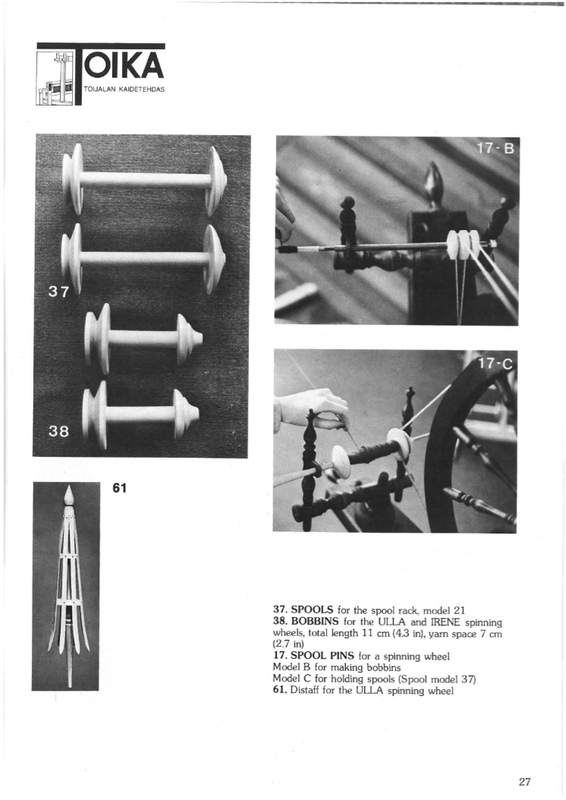 EDIT 2: More information from Toika today in an e-mail to me: Toika stopped making spinning wheels in the 1980s. Most of their wheels were exported, and the upright Irene was made for export only. This explains why I haven’t seen any of the Toika wheels yet here in Finland. October 26, 2015 - 3:26 pm Marilyn F.
Yes, it is sad to lose ones history with old farm implements and household tools like the spinning wheel. Its not only history that is lost but also the “how to use” the tools that is lost. Not that spinning is totally lost, the mechanics of the spinning wheel are not complicated and the spinners we have these days have revived the art and perhaps carried it far beyond the utilitarian – survival skills neede in the past. 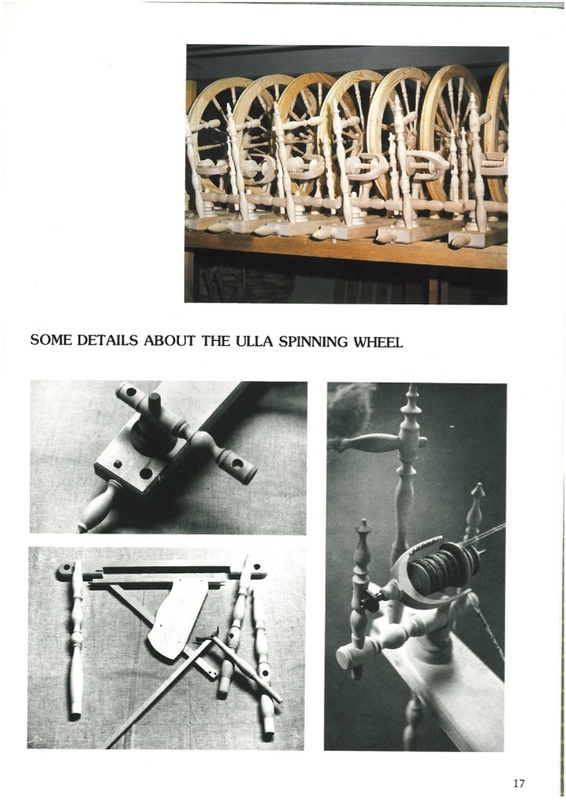 It is nice to see this advertising from Toika and it would be wonderful if someone could carry on digging into its and other wheelmakers history. Talking to older people who will soon be gone, may also give invaluable details in the craft of spinning and wheel making. For us in the US we have a series of books called “The Foxfire Book” that chronicles regional farm life, tools, survival and crafts, some of which are still in use today and came with them from the British Isles, Europe, Scandinavia, etc. I know I love my Toika Ulla wheel that I have been spinning on for 38 years. Wonderfully light weight and easy to take apart and carry to various ethnic events. I had high speed bobbins made by a local woodworker and have spun some extremely fine yarns on it. The public is drawn to its Sleeping Beauty design. Children point to the top of the distaff and ask if that is where Sleeping Beauty pricked her finger, as paintings show in the storybook form – the distaff is depicted as being the spindle – the word used in the text of the story. I point out to them where the spindle actually is and that it can be pointed and much easier to prick ones finger on than the distaff . Children have good questions. And Ravelry has a Toika group? Very interesting. Sad that we loose part of our history, but that’s how it’s always been. So much has been lost, and will be in the future also. I’ve added a little bit more facts about the Toika wheels in the post, Marilyn! October 27, 2015 - 12:57 am Marilyn F.
Great that you are getting more bits of information on the Toika Wheels. Interesting that they were made mostly for export. I have a Toika Wheel. I purchased it in 1972 from Robin and Russ, a weaving store in McMinnville in Oregon State. It was my first wheel. At the time most people in the U.S. were buying Ashfords. I believed I received a catalog from Robin and Russ after buying a copy of Eileen Bolton’s, Lichens for Vegetable Dyeing and saw the wheel. I’ll send a photo when I figure out how to do so. It is still a wonderful wheel but has had a few repairs after several moves and many trips to the county fair. So you’ve been spinning for a long time, then! Great to hear the wheel has been along all this time. October 27, 2015 - 12:55 am Marilyn F.
I wonder if my wheel didn’t also come from Robin and Russ. I bought it in 1978 from my spinning teacher who lived near Portland, so our wheels are the same vintage. The Toika was also my first wheel and I spun on it for many years before I could get comfortable spinning on any other wheel. Its true most people were buying Ashfords at that time. The only wheel I’ve ever had is an upright one, but it’s Polish. Kromski Minstrel. I think the Minstrel is so beautiful! Thanks so much for the information on the Ulla. This was my first wheel, purchased as a kit from The Whole Earth catalog, if I remember correctly. That was in 1974 or 1975. I never knew the name of the wheel or where it was made. It was the only wheel I could find when I was learning to spin. My Dad made a beautiful tow flax distaff to finish it off. It still spins great. Thanks – so nice to hear your wheel still spins! 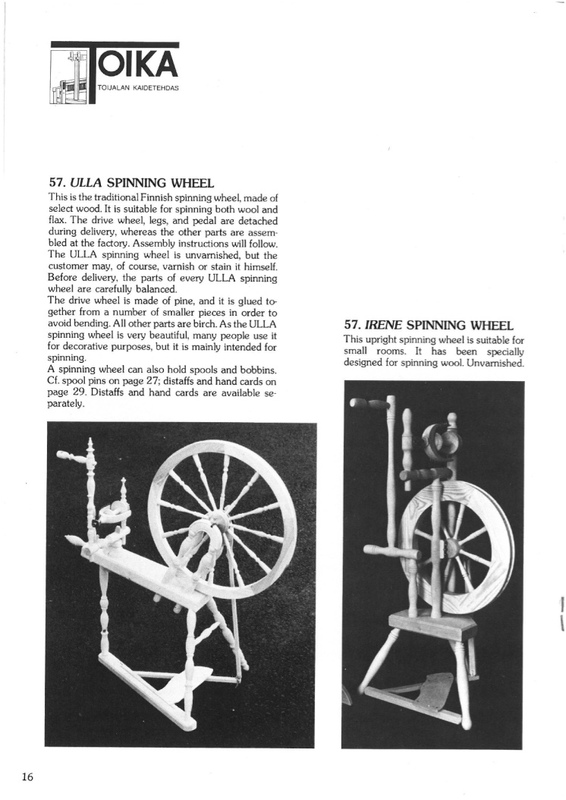 My first spinning wheel was a Toika Ulla as well, purchased for $20 at a yard sale. My favorite wheel, a fast and fine spinner! Wish they still made them like this. January 19, 2016 - 8:21 am Derek D.
No, I hadn’t. Thank you so much! What a nice wheel it is, even more beautiful when you see it in action. Toika appears to have tweaked their design at some point. I just picked up an Ulla with only single wheel supports, rather than the double arms with the arch. Can send pics if you want. Yes, please send me photos! Gladly. Where should I send them? This portal does not provide a way to send pictures or direct messages. I have an irene von Toika it is in perfect condition. she now lives in the outskirts of Amsterdam in my atelier. I just bought her last week and she is perfect.